After half a century with no ability to legally visit, dive & enjoy the lush wonders of Cuba, due to the Cold War Trade Embargo just recently lifted by the U.S. government, it’s now open for our good clients to learn about Cuba’s unique marine environment during an Oceans for Youth Foundation People-to-People educational program. Cuba Travel Program will include 10 days/9 nights arriving in Havana, Cuba The on Thursday and departing Havana on Saturday. 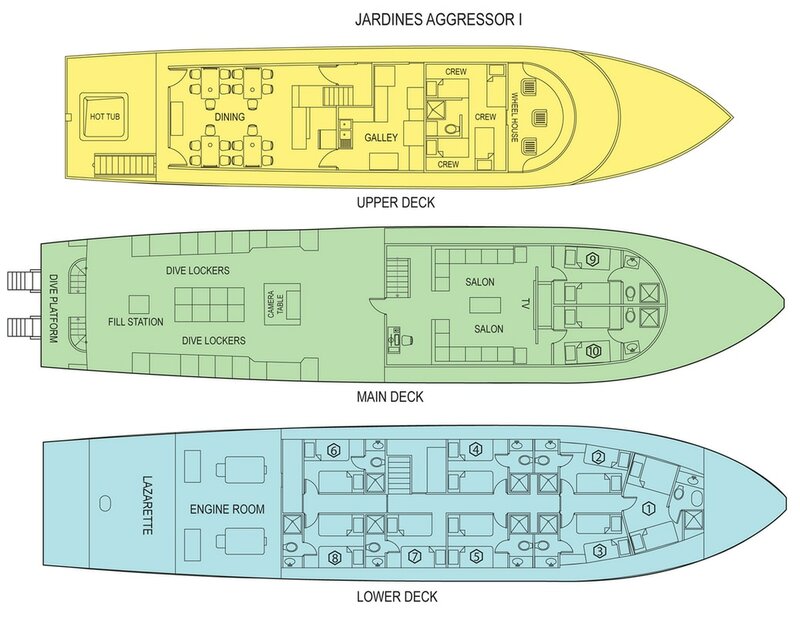 The JARDINES AGGRESSOR has been sailing for special dive vacation groups since March 2016; & a new sister yacht will set sail early next year to help us handle the very high numbers of interested dive clients. During our program, travelers will spend 2 hotel nights at the Iberostar Parque Central Hotel in Havana, and will visit with Cuban scientists and marine experts about ocean conservation and cultural exchanges. One of these will include a presentation by world renowned expert, Dr. Julio A. Baisre. Interactive exchanges will discuss how Cuba has maintained one of the healthiest marine ecosystems in the Caribbean. Travelers will visit the town of Cojimar and Habana Vieja before spending a week on the Jardines Aggressor liveaboard. Seven days of the program will be spent on the Jardines Aggressor liveaboard exploring the spectacular Gardens of the Queen (Jardines de la Reina) National Park, located 60 miles off the southern coast. During the week, biologists and Cuban specialists will host discussions and presentations on the marine environment, conservation, and the importance of this magnificient ecosystem. The Cuba Travel Program will include a presentation by Dr. Julio Baisre, world renowned expert in the study of spiny lobster. Dr. Baisre graduated in 1968 from the University of Havana as a marine biologist. He completed his Ph.D. in Fisheries, “Fisheries Resources of the Cuban Archipelago: Ecological Background and Strategies for Management.” He was awarded the Carlos J. Finlay Order, Cuba’s highest scientific recognition, served as President of the Cuban Aquaculture Society and headed the multidisciplinary group which drafted the new Fisheries Law which was formally approved by the Cuban Council of State. He has been instrumental in the development, introduction and enforcement of many regulations in the Cuban fisheries sector including aquaculture development, species introduction and licensing systems. Transfers to/from Havana José Martí International Airport; located 9 miles from Havana on start/end day of program. 2 nights hotel accommodations at the Iberostar Parque Central Hotel in Havana, all meals, dinner at Ivans Restaurant. Full day Friday; Meeting with Cuban scientists and biologists speaking on ocean conservation and research, visit to Fortress of El Morro or Hemingway House, town of Cojimar, Habana Vieja, lunch in Bodeguita del Medio and dinner at Cafe de Oriente or Moraleja. In November 2014, Oceans for Youth Foundation applied to the Department of Treasury, Office of Foreign Assets Control (“OFAC”), Licensing Division for a specific license for a “people-to-people” educational exchange under 31 C.F.R. 515.565(b) of the Cuban Asset Control Regulations (the “Regulations”). In response, Oceans for Youth Foundation received an approval in February 2015. It is on this basis that the Foundation has an OFAC License to conduct its Cuba Travel Program, in which you will be participating. Ocean for Youth’s Cuba Travel Program is in partnership with the Jardines Aggressor, owned by Vessel Marine Holdings, a Panamanian Company. Under OFAC Regulations, there are specific procedures by all travelers under our Cuba license. Direct people-to-people interactions between Americans with Cubans (youths and their parents; local marine officials; and marine professionals) will provide a unique opportunity for U.S. travel participants to understand the setting in which Cubans experience their own marine environment. Individuals on the island – particularly Cuban professionals and Cuban youth (and their parents) who have limited opportunities to meet foreign counterparts – will acquire different perspectives on marine life, conservation, and stewardship. Travel participants with the Foundation who meet this slice of the Cuban population will experience a closeness with their Cuban counterparts where there had not been before. Three days of our visit will be on land, where you will meet with marine professionals. Six days of our visit will be at sea, in the Gardens of the Queen National Park, Cuba's first marine park. Onboard the Jardines Aggressor, you will meet with Cuban specialists and be able to scuba dive in one of the healthiest marine ecosystems in Cuba. There are many daily international flights available. LiveAboard Vacations is an authorized travel provider for the Cuba Travel Program and can book your airline travel reservations. Travelers will enjoy staying at the elegant 5-star Iberostar Parque Central Hotel located in central Havana, Cuba Thursday and Friday nights. Known for its Spanish colonial-style architecture, which pulls in the rich culture of the streets, the IBEROSTAR Parque Central Hotel is an excellent starting point for the Cuba Travel Program which is nestled in the heart of Havana. Travelers will admire beautiful city views from the charming French windows and doors of the hotel. The restaurant has some of the best international cuisine in Havana, but above all, the most impressive Cuban fare.The hotel is conveniently close to the José Martí International Airport and only 20 minutes away. Travelers will depart Havana Saturday morning as a group at 8 am for a 4 - 5 hour drive (lunch included) to Jucaro to board the Jardines Aggressor. After all travelers are onboard, the boat will depart for the Gardens of the Queen. Throughout the week, scuba diving will be offered from Sunday until Friday around noon. The Jardines Aggressor will depart after lunch back to Jucaro where travelers will stay onboard for dinner then depart Saturday morning as a group back to the José Martí Airport for their flight home. Saturday between 6 - 7 am, travelers will depart the Jardines Aggressor to the José Marti International Airport where the Cuba Travel Program will end. Travelers will stop for lunch on the way to the airport. Arrival at the airport will be at approximately 1 pm - 2 pm. There is a required departure tax of $25CUC (Cuban Peso) per person that has to be paid in CUC if it is not included in the price of your airline ticket. Some airlines will include the departure tax, please verify with the airline carrier.